Bali is one the best family-holiday destinations in the world. 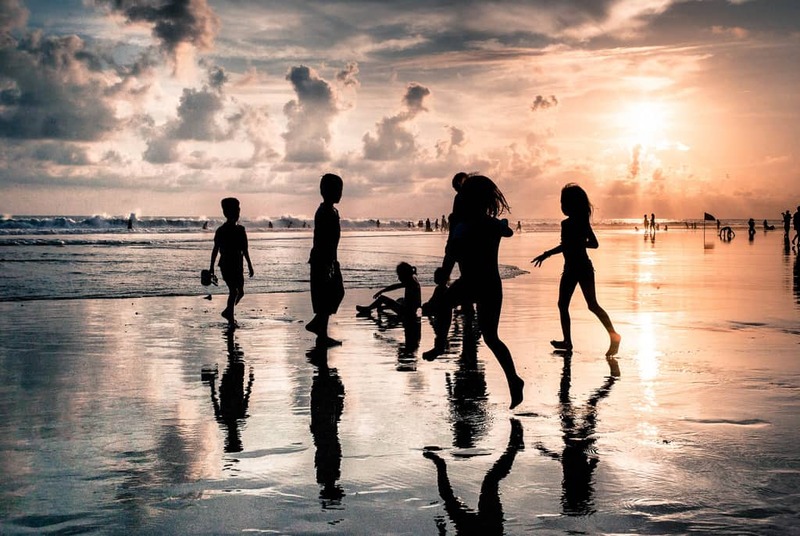 Adventures in nature, learning new sports and activities, as well as watching and participating in local cultural experiences are all on offer for kids in Bali. And with plenty of agencies and villas offering cheap child minding services, it’s also easy to arrange parents-only time. Set in tropical gardens in Kuta Waterbom waterpark has a series of 17 water rides catering for every age of children plus more leisurely activities like reflexology, hair braiding, manicure and pedicure for adults. Circus Waterpark in Tuban is a smaller and cheaper version of Waterbom. New Kuta Green Park, located in Jimbaran, has water slides and other outdoor activities including paint ball. Lollipops Playland in Seminyak is for kids from age one to 12 and has a range of activities including water slides, a toddler play area, obstacle course, trampoline and ball games. The Balinese are crazy about kites. 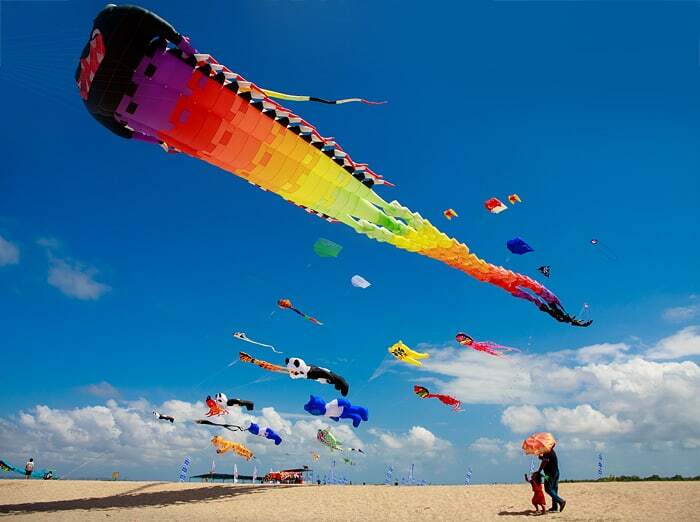 They even have a festival dedicated to kites, held in July, where the bigger the better. Seasonal breezes make the island the ideal place to fly a kit and the colourful traditional kites also make a great souvenir wall hanging. 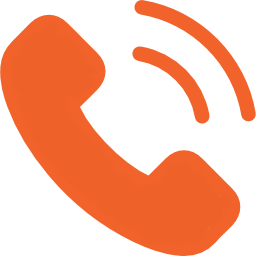 Surf schools are located in Kuta, Seminyak, Sanur and Legian. Lessons for kids are generally held at low tide when the waves are smallest and start for age 6 although some schools may take younger children. Some surf schools will insist on private lessons for children under 12 because of the extra care needed to supervise them. Many surf schools also offer paddle boarding and kite surfing lessons. There are a few places to ride an elephant in Bali. The Bali Safari Park is about an hour’s drive north of Ubud and the Bali Elephant Camp is more centrally located, in Denpasar. The Bali Zoo is situated in Gianyar and in addition to its daily opening hours offers night tours from 6pm. The Bali Safari and Marine Park is less than an hour from Sanur and has around 60 species of animals including tigers and giraffes. Tours are led by trained zoologists and and if the kids get bored there is also a water park on site. Bali Bird Park in Gianyar has over 1000 birds and 250 species with natural enclosures and walk-through aviaries. With their indoor, air-conditioned location, indoor playgrounds offer respite from one of those steamy Bali days. Peek A Boo indoor playground is located at Sanur and suitable for kids up to age 10. Kidsworld in Tampaksiring has a number of inflatable playpens and is for children up to age 12. Bali Dolphin Tour leaves from Lovina but beware it’s an early start and the tour may only deliver a glimpse of a passing pod at best. However Lovina is worth a trip to see the unspoilt natural surrounds of Northern Bali. Bali Dolphins, just off the coast of Sanur, allows a much more personal experience with the chance to spend 40 minutes in a pen interacting with dolphins. Children as young as four can participate but it’s popular so book at least a month before your trip. If you want a little more adrenalin in your underwater animal adventure, a visit to Shark Island will do the trick. This eco adventure in the eastern waters of Serangan allows customers to enter a pen, via a safety cage, to see black-tip and white-tip reef sharks mostly pups. 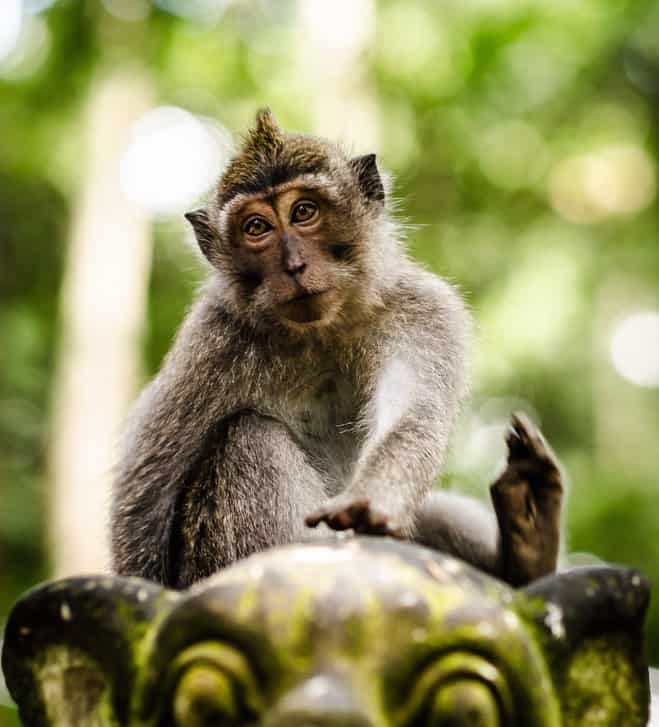 The Monkey Forest Sanctuary is located in Ubud, only ten minutes walk from the centre of the town. Bananas can be purchased at the gates and fed to the animals during the visit. Ubud is the best place for children to learn any kind craft and popular local activities. Some highlights include wood carvings, painting, silver smithing, batik and gamelan – traditional percussion music. Bedugul Botanical Garden is the setting for the forest adventure Bali Treetop which has six activity courses involving Tarzan swings, aerial nets, and zip wires suitable for kids and adults. The mornings are the best time to go in order to avoid the crowds and rain. 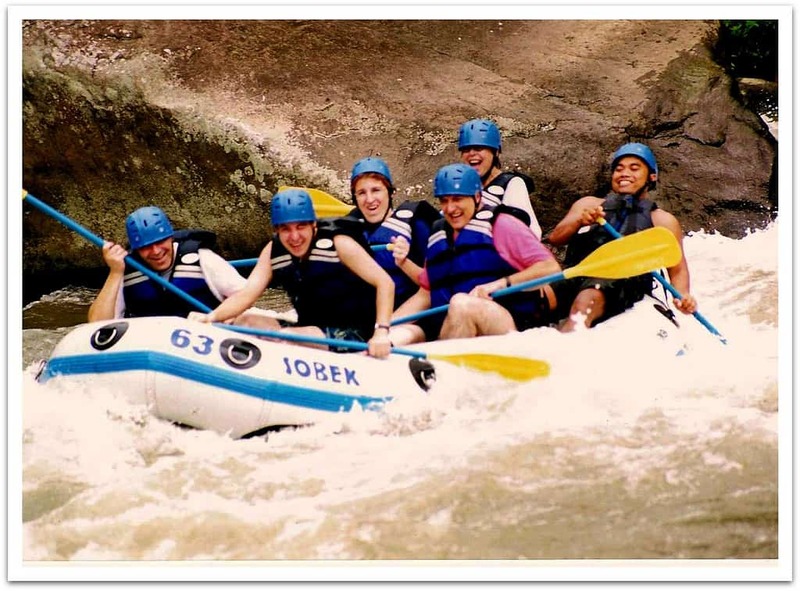 Not all rafting in Bali is of the white-knuckle kind. If you have kids the Ayung river, graded class II, is gentle enough for small children and the most nervous adults to relax and enjoy. Children as young as eight can learn to scuba dive and at age ten the PADI course is the same as the adult course. The ideal location is the shipwrecks of Tulamben, which is also a great spot to take kids snorkelling. If you child is of the age that would normally require a car seat back home, don’t expect a Bali taxi or hire car to have seat belts let alone a child car seat. So even if you bring a car seat from home there is not necessarily going to be any way to anchor it. Taxis with a child seat do exist but it will take some perseverance to find one. A nanny can be found via several nanny agencies that operate on the island. A nanny agency will usually charge around US$5 an hour and inhouse babysitting is often less expensive. For families looking for restaurants catering to children there are many options on Bali. In Kuta there’s Papa’s Italian Family Restaurant, TJ’s Mexican Bar and Restaurant, Splash Bistro which includes use of the large pool, and Zanzibar for pizzas on the beachfront. In Seminyak try Warung Italia and Tuesday Night Pizza Club. Jimbaran is best for a laid-back meal on the beach where parents can watch the sunset while kids can play in the sand next to the dinner table. At Sanur try the Beach Cafe to find dishes specifically for kids. Pirates Bay in Nusa Dua, open day and evening, will thrill the children with treehouse dining and pirate wait staff as well as activities like kite making, zip lining and treasure hunts.